The Pro 6MR is a portable mid rise hydraulic lift with a weight capacity of 6,000 lbs. The Pro 6MR is an excellent choice for any body shop. It is also popular with customers that do not have the ceiling clearance for a two post car or truck lift, or prefer something portable. The Pro 6MR comes with a free set of truck adapters. Capacity 6,000 lbs. 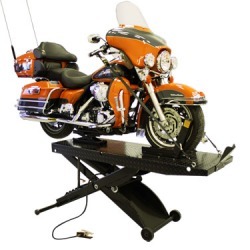 Height-Lowered (Swing Arms) 5"
Height Raised Maximum 52" Width 41"
The Pro Cycle has quickly become one of America’s #1 motorcycle lifts. 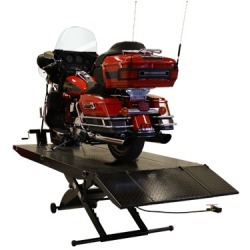 All Pro Cycle lifts have a 93” table, a 20” approach ramp, and are air operated. 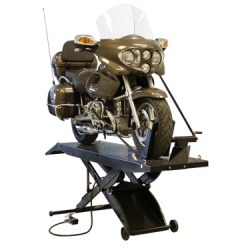 Direct Lift provides the best in motorcycle lifts for the hobbyist as well as the professional motorcycle shop. The Pro Cycle bike lift has a weight capacity of 1000 lbs, and is suitable for a wide range of different style bikes. Length w/ ramp 113" Length w/o ramp 93"
Width 24" Full Rise 33"
Fully Lowered 7-1/4" Capacity 1,000 lbs. Shipping Weight 500 lbs. Length of Cut Out 19-1/2"
The Pro Cycle XLT comes with two 12” side extensions, a wheel vise and dolly. 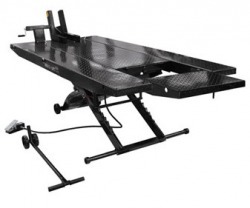 The Pro Cycle XLT is an excellent choice for anyone looking to service ATVs, motorcycles, or anything else that will fit on the 93” long x 48” wide table. Wheeled dolly included Available in Black color only. Width 48" Full Rise 33"
The Pro Cycle DT and Pro Cycle XLT DT are the same as their standard bike lift counterparts (the Pro Cycle and Pro Cycle XLT, respectively), except the “DT” aka “Drop Tail” has been added for easier wheel service. 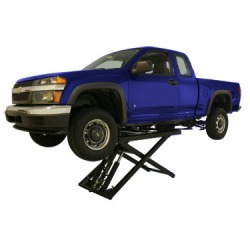 This lift is perfect for use as an ATV or motorcycles lift. Shipping Weight 690 lbs. 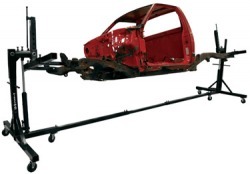 Length of Cut Out 19-1/2"
The Rotisserie is the perfect solution for any hobbyist or professional working on restoring car and truck bodies and frames. The Rotisserie features 360 degrees of movement and is fully adjustable. Optional adapters included Available in Black color only. Overall Width (Adjustable Mounting Brackets) 13 1/4" - 53 1/4" Maximum Width of Vehicle 85"
Working Height 18" - 48" Working Length Max 228"
features a hydraulic cylinder with 26 locking positions. While working on a side by side, golf cart or atv you always reduce wear and tear on the lift by lowering to a lock. With that many positions to choose from you can find the right working height for your shop. Reduce back strain, knee strain and get into places and modify that ride. Detail the heck out of the thing then go get it muddy again.Work at a comfortable sitting height, for detail work or longer jobs.Work at a comfortable standing height, similar to working on a bench.Work at eye level and never need to bend over. Perfect for UTV's, Motorcycles, Golf carts, etc.